For other places with the same name, see Camberwell (disambiguation). Camberwell (/ˈkæmbərˌwɛl/) is a district of South London, England, within the London Borough of Southwark. It is located 2.7 miles (4.3 km) southeast of Charing Cross. The name Camberwell was first applied to the Parish of St Giles, Camberwell, which included the village of Camberwell, and the hamlets of Peckham, Dulwich, Nunhead, and part of Herne Hill (the rest of Herne Hill was in the parish of Lambeth). Until 1889, it was part of the county of Surrey. In 1900 the original parish became the Metropolitan Borough of Camberwell. In 1965, most of the Borough of Camberwell was merged into the London Borough of Southwark. To the west, part of both West Dulwich and Herne Hill come under the London Borough of Lambeth. Nowadays the district known as Camberwell covers a much smaller area than the ancient parish, and is clearly distinguished from Peckham, Dulwich and Herne Hill. Camberwell Green is now a very small area of common land; it was once a traditional village green on which was held an annual fair, of ancient origin, which rivalled that of Greenwich. A map showing the wards of Metropolitan Borough of Camberwell as they appeared in 1916, This includes Dulwich, Peckham, etc. Camberwell St Giles formed an ancient, and later civil, parish in the Brixton hundred of Surrey. The parish covered 4,570 acres (18.5 km2) in 1831 and was divided into the liberty of Peckham to the east and the hamlet of Dulwich to the southwest, as well as Camberwell proper. The parish tapered in the south to form a point in what is now known as the Crystal Palace area. In 1801, the population was 7,059 and by 1851 this had risen to 54,667. In 1829, it was included in the Metropolitan Police District and in 1855 it was included in the area of responsibility of the Metropolitan Board of Works, with Camberwell Vestry nominating one member to the board. 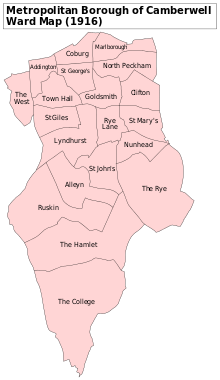 In 1889 the board was replaced by the London County Council and Camberwell was removed from Surrey, to form part of the County of London. In 1900, the area of the Camberwell parish became the Metropolitan Borough of Camberwell. 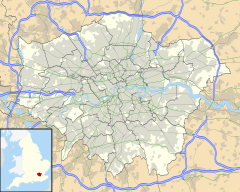 In 1965, the metropolitan borough was abolished and its former area became the southern part of the London Borough of Southwark in Greater London. The western part of the area is situated in the adjacent London Borough of Lambeth. The area has historically been home to many factories, including R. White's Lemonade, which originated in Camberwell, as well as Dualit toasters. Neither of these companies is now based in the area. Wilson's School was founded in 1615 in Camberwell by Royal Charter by Edward Wilson, vicar of the Parish of Camberwell. The charter was granted by James I. The school moved to its current site in Croydon in 1975. A school for girls, Mary Datchelor Girl's School, was established in Camberwell in 1877. It was built on two houses at 15 and 17 Grove Lane, the location of a former manor house. All except one of its 30 pupils came from the parish of St Andrew Undershaft in the City of London. The funding for the school came from a bequest from Mary Datchelor, who died childless. Proceeds of a property in Threadneedle Street used as a coffee-house were used to pay for apprenticeships for the poor boys of the parish, but as demographics in the City changed, it was decided to set up a school. By the 1970s, the school was receiving funding from the Clothworkers’ Company and the Inner London Education Authority funded teaching posts. The school came under pressure from ILEA to become co-educational and comprehensive. Faced with this choice or becoming fully private, the school's governors instead decided to close in 1981. The school buildings were later used as offices for the charity Save the Children but have now been converted to flats.Camberwell Collegiate School was an independent school located on the eastern side of Camberwell Grove, directly opposite the Grove Chapel.The Collegiate College had some success for a while, and led to the closure for some decades of the Denmark Hill Grammar School. However it had difficulty competing with other nearby schools including Dulwich College, and was closed in 1867.The land was sold for building. Camberwell today is a mixture of relatively well preserved Georgian and 20th-century housing, including a number of tower blocks. Camberwell Grove, Grove Lane and Addington Square have some of London's most elegant and well-preserved Georgian houses. The Salvation Army's William Booth Memorial Training College, designed by Giles Gilbert Scott, was completed in 1932: it towers over South London from Denmark Hill. It has a similar monumental impressiveness to Gilbert Scott's other local buildings, Battersea Power Station and the Tate Modern, although its simplicity is partly the result of repeated budget cuts during its construction: much more detail, including carved Gothic stonework surrounding the windows, was originally planned. Camberwell is home to one of London's largest teaching hospitals, King's College Hospital with associated medical school the Guy’s King’s and St Thomas’ (GKT) School of Medicine. The Maudsley Hospital, an internationally significant psychiatric hospital, is located in Camberwell along with the Institute of Psychiatry. Early music halls in Camberwell were in the back hall of public houses. One, the "Father Redcap" (1853) still stands by Camberwell Green, but internally, much altered. In 1896, the Dan Leno company opened the "Oriental Palace of Varieties", on Denmark Hill. This successful venture was soon replaced with a new theatre, designed by Ernest A.E. Woodrow and with a capacity of 1,553, in 1899, named the "Camberwell Palace". This was further expanded by architect Lewen Sharp in 1908. By 1912, the theatre was showing films as a part of the variety programme and became an ABC cinema in September 1932 – known simply as "The Palace Cinema". It reopened as a variety theatre in 1943, but closed on 28 April 1956 and was demolished. The 1957 film, The Smallest Show on Earth, which tells the tale of a struggling family-run suburban cinema, is thought to have been based on the Palace. Nearby, marked by Orpheus Street, was the "Metropole Theatre and Opera House", presenting transfers of West End shows. This was demolished to build an Odeon cinema in 1939. The cinema seated 2,470, and has since been demolished. A second ABC cinema, known originally as the Regal Cinema and later as the ABC Camberwell, opened in 1940. With only one screen but 2,470 seats, the cinema was one of the largest suburban cinemas in London and continued to operate until 1973, after which it was used as a bingo hall until February 2010. The building retains its Art Deco style and is Grade II listed. The Church of the Sacred Heart, Camberwell has been listed Grade II on the National Heritage List for England since 2015. On 3 July 2009 a major fire swept through Lakanal House, a twelve-storey tower block. Six people were killed and at least 20 people were injured. The Camberwell beauty (also Camberwell Beauty) is a butterfly (Nymphalis antiopa) which is rarely found in the UK - it is so named because two examples were first identified on Coldharbour Lane, Camberwell in 1748. A large mosaic of the Camberwell beauty used to adorn the Samuel Jones paper factory on Southampton Way. The paper factory has since been demolished but the mosaic was removed and re-installed on the side of Lynn Boxing Club on Wells Way. Camberwell has several art galleries including Camberwell College of Arts, the South London Gallery and numerous smaller commercial art spaces. There is an annual Camberwell Arts Festival in the summer. The Blue Elephant Theatre on Bethwin Road is the only theatre venue in Camberwell. A group now known as the YBAs (the Young British Artists) began in Camberwell - in the Millard building of Goldsmith's College on Cormont Road. A former training college for women teachers, the Millard was the home of Goldsmiths Fine Art and Textiles department until 1988. It was converted to flats in 1996 and is now known as St Gabriel's Manor. The core of the later-to-be YBAs, graduated from the Goldsmiths BA Fine Art degree course in the classes of 1987–90. Liam Gillick, Fiona Rae, Steve Park and Sarah Lucas, were graduates in the class of 1987. Ian Davenport, Michael Landy, Gary Hume, Anya Gallaccio, Henry Bond and Angela Bulloch, were graduates in the class of 1988; Damien Hirst, Angus Fairhurst, Mat Collishaw, Simon Patterson, and Abigail Lane, were graduates from the class of 1989; whilst Gillian Wearing, and Sam Taylor-Wood, were graduates from the class of 1990. During the years 1987–90, the teaching staff on the Goldsmiths BA Fine Art included Jon Thompson, Richard Wentworth, Michael Craig-Martin, Ian Jeffrey, Helen Chadwick, Mark Wallinger, Judith Cowan and Glen Baxter. Collishaw has a studio in a pub in Camberwell. as does the sculptor Anish Kapoor. Not yet housed in the university building at New Cross to which it eventually moved in the late 1980s, Goldsmiths was a stone's throw away in Myatts Field on the other side of Camberwell Green. In contrast to Camberwell's Friday night bacchanal, Goldsmith's held its disco on a Tuesday evening with dinner ladies serving drinks, including tea, from a service hatch. This indicated to me that Goldsmiths was deeply uncool. The building was also the hospital where Vera Brittain served as a nurse and described in her memoir Testament of Youth. Thomas Hood, humorist and author of The Song of the Shirt, lived in Camberwell from 1840 for two years; initially at 8, South Place, (now 181, Camberwell New Road). He later moved to 2, Union Row (now 266, High Street). He wrote to friends praising the clean air. In late 1841, he moved to St John's Wood. The Victorian art critic and watercolourist John Ruskin lived at 163 Denmark Hill from 1847, but moved out in 1872 as the railways spoiled his view. Ruskin designed part of a stained-glass window in St Giles' Church, Camberwell. Ruskin Park is named after him, and there is also a John Ruskin Street. Another famous writer who lived in the area was the poet Robert Browning, who was born in nearby Walworth, and lived there until he was 28. Novelist George Gissing, in the summer of 1893, took lodgings at 76 Burton Road, Brixton. From Burton Road he went for long walks through nearby Camberwell, soaking up impressions of the way of life he saw emerging there." This led him to writing In the Year of Jubilee, the story of "the romantic and sexual initiation of a suburban heroine, Nancy Lord." Gissing originally called his novel Miss Lord of Camberwell.Muriel Spark, the author of The Prime of Miss Jean Brodie and The Ballad of Peckham Rye lived, between 1955 and 1965, in a bedsit at 13 Baldwin Crescent, Camberwell. The novelist Mary Jane Staples, who grew up in Walworth, wrote a book called The King of Camberwell, the third instalment of her Adams family saga about Cockney life. Comedian Jenny Eclair is a long term resident of Camberwell, and the area features in her 2001 novel Camberwell Beauty, named after a species of butterfly. Playwright Martin McDonagh and his brother, writer/director John Michael McDonagh, live in Camberwell. The 2014 novel The Paying Guests by Sarah Waters is set in 1920s Camberwell. Nearby Peckham Rye was an important spot in the imaginative and creative development of poet William Blake, who when he was eight, he claimed to have seen the Prophet Ezekiel there under a bush, and he was probably ten years old when he had a vision of angels in a tree. Camberwell has played host to many festivals over the years, with the long-running Camberwell Arts Festival celebrating 20 years in 2014, and Camberwell Fair taking place on Camberwell Green in 2015, 2017 and 2018, resurrecting an ancient Fair that took place on the same green from 1279 to 1855. Camberwell is connected to central London by Camberwell Road in the north and Camberwell New Road in the west and is well served by bus routes, with easy to travel into central London in times of 20 to 30 minutes, outside of rush hour. Camberwell–as distinct from Peckham, Dulwich and Herne Hill–had been served by three railway stations until the First World War, Camberwell Gate, Camberwell New Road and Denmark Hill. Camberwell Gate was a railway station in Walworth Road, on the London Chatham & Dover Railway, which opened on 1 May 1863 on the route of the company's ambitious plan to extend into the City of London. Its name was changed in 1865 to Walworth Road railway station. Camberwell New Road opened in 1862 (originally called Camberwell) but was closed to passengers in 1916 and closed to all traffic in 1964. The possibility of the station's re-opening has been raised in recent years. Denmark Hill station was built between 1864 and 1866. Like many less well used stations in inner London, Camberwell Gate and Camberwell New Road were closed in 1916 'temporarily' because of war shortages but were never reopened. The nearest railway stations are Loughborough Junction and Denmark Hill, which is also served by London Overground. Both have journey times of less than 10 minutes into Central London. London Underground has planned a Bakerloo line extension to Camberwell on at least three occasions since the 1930s. In March 2016 it was reported by Transport for London that proposals to re-open the Camberwell station are being considered with other stakeholders, including the London Borough of Southwark. Initial feasibility indicates it would be possible to construct a modern station on the site if timetables could be modified to accommodate Camberwell as an additional stop. TfL will be working with Network Rail and the boroughs of Southwark and Lambeth to further develop the feasibility of this proposal. Statesman Joseph Chamberlain, born Camberwell, 1836 and father of Neville Chamberlain. Residents of the area have included children's author Enid Mary Blyton, who was born at 354 Lordship Lane, East Dulwich, on 11 August 1897 (though shortly afterwards the family moved to Beckenham), and the former leader of the TGWU, Jack Jones (trade unionist), who lived on the Ruskin House Park estate. Others include the former editor of The Guardian Peter Preston. The Guardian columnist Zoe Williams is another resident, whilst Florence Welch of the rock band Florence + the Machine also lives in the area, as do actresses Lorraine Chase and Jenny Agutter. Syd Barrett, one of the founders of Pink Floyd, studied at Camberwell College of Arts from 1964. Clifford Harper, illustrator and anarchist, has lived in Camberwell since 1974. The avant-garde band Camberwell Now named themselves after the area. Basement Jaxx recorded three songs about Camberwell: "Camberwell Skies", "Camberskank" and "I live in Camberwell" which are on The Singles: Special Edition album (2005). Camberwell is referred to in the film Withnail and I — "Camberwell carrot" is the name of the enormous spliff rolled using 12 rolling papers, by Danny the dealer. His explanation for the name is, "I invented it in Camberwell and it looks like a carrot". Elizabeth Patterson Bonaparte gave birth to her son, Jérôme Napoléon Bonaparte, the nephew of the Emperor Napoleon I, in Camberwell in 1805. Thomas Brodie-Sangster, actor and musician. Marianne Jean-Baptiste, British actress, director and singer-songwriter. ^ "Camberwell - British History Online". www.british-history.ac.uk. ^ a b "Ancient well that gave name to Camberwell unearthed". The Daily Telegraph. London. 27 May 2009. Retrieved 27 February 2011. ^ "Mary Datchelor School, Camberwell Grove – Works – Southwark Heritage". heritage.southwark.gov.uk. ^ "Mary Datchelor School - Exploring Southwark". 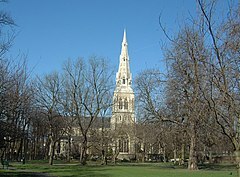 www.exploringsouthwark.co.uk. ^ Walford, Edward (1878). "Camberwell". Old and New London: Volume 6. Institute of Historical Research. Retrieved 7 September 2012. ^ Aldrich, Richard (2012). "Chapter 2". School and Society in Victorian Britain: Joseph Payne and the New World of Education. London: Routledge. ISBN 978-0415686532. ^ Lewis, Samuel. A topographical dictionary of England. 1 (4th ed.). London. p. 417. ^ "King's College London - Institute of Psychiatry, Psychology & Neuroscience Denmark Hill Campus". www.kcl.ac.uk. ^ Vanessa, Fonesca. "Nymphalis antiopa". Animal Diversity Web. University of Michigan Museum of Zoology. Retrieved 13 October 2014. ^ "Home page - Blue Elephant Theatre". www.blueelephanttheatre.co.uk. ^ "Art In The East End: Mat Collishaw". hungertv.com. 28 May 2012. Retrieved 7 November 2012. ^ "Welcome to Camberwell Guide". Southlondonguide.co.uk. Retrieved 27 February 2011. ^ "The Ruskin Window". Stgilescamberwell.org.uk. Archived from the original on 16 November 2010. Retrieved 27 February 2011. ^ "Camberwell history - Southwark's historic villages". Southwark.gov.uk. 26 January 2010. Archived from the original on 23 March 2011. Retrieved 27 February 2011. ^ Paul Delany, to In the Year of Jubilee. London: J.M. Dent, 1994. ^ Mount, Ferdinand, "The Go-Away Bird", The Spectator (review of Muriel Spark, the Biography by Martin Stannard), archived from the original on 18 June 2010, retrieved 13 April 2016 . ^ "Mary Jane Staples books". Lovereading.co.uk. Retrieved 27 February 2011. ^ Wight, Colin. "Virtual books: images only - The Notebook of William Blake: Introduction". www.bl.uk. ^ Blackfriars Bridge - Loughborough Junction, UK. ^ "Living in Camberwell: area guide to homes, schools and transport links". 22 August 2014. ^ "Peter Preston: A bridge too far". The Guardian. London. 24 August 2009. Retrieved 27 February 2011. ^ "Zoe Williams: My neighbour, the Leopard Man of Peckham". The Guardian. London. Retrieved 27 February 2011. ^ Amy Grier (31 July 2009). "Florence Welch - My London". Thisislondon.co.uk. Archived from the original on 14 September 2010. Retrieved 27 February 2011. ^ Anstead, Mark (10 October 2011). "Luton airport wafted me... to this paradise: Lorraine Chase sells Georgian pad paid for by classic adverts". Daily Mail. London. ^ Kirby, Terry (30 November 2006). "Syd Barrett's last remnants sold in frenzy of bidding". The Independent. London. Retrieved 27 February 2011. ^ Göran - 4 December 2011. "The 100 best London songs – Songs about London". Time Out London. Retrieved 7 November 2012. ^ "Jerome Napoleon Bonaparte, Napoleon's American Nephew - Shannon Selin". 20 February 2015. ^ The Guardian', "Suspect arrested for Bowen mugging"
^ Julian Amery and J.L. Garvin, The life of Joseph Chamberlain, Six volumes, Macmillan, 1932–1969. ^ Simon Hattenstone, "Marianne Jean-Baptiste: 'It's not a sob story - I could have stayed in the UK and fought it out'", The Guardian, 15 June 2015. ^ Southwark News "DOUBLE PLAQUE IN HERNE HILL FOR HOLLYWOOD STARS STANLEY AND IDA LUPINO"
^ "Birthdays". The Guardian. Guardian Media. 22 July 2014. p. 37. ^ Lowie, Robert H. “Edward B. Tylor.” American Anthropologist, vol. 19, no. 2, 1917, p. 262. JSTOR, . ^ Hugman, Barry J., ed. (2010). The PFA Footballers' Who's Who 2010–11. Mainstream Publishing. p. 430. ISBN 978-1-84596-601-0. ^ Cawley, Richard (9 October 2018). "South Londoner Jadon Sancho could make full England debut – at the age of just 18". South London Press. Retrieved 11 October 2018. Wikimedia Commons has media related to Camberwell.